I'm not an architect, but as I've grown as a furniture maker, the connections between furniture and architecture is strong and undeniable. Gustav Stickley, a furniture maker, designed homes, and published other's plans for craftsman homes, in his The Craftsman magazine. Frank Lloyd Wright not only designed homes, but often the furniture that went in them (the control freak that he was). So its not surprising to find inspiration in period buildings. Recently, I went on a walking tour / architecture tour of some turn-of-the-last-century homes and buildings in my neighborhood. As a period furniture maker, a fan of craftsman / arts & crafts furniture, and the history of my city & neighborhood, this was a slam dunk for me. The tour was a mixed bag of highs and lows. There were some places that had been "modernized" by clueless people who had more money than taste, not "getting it", and ruining once classic interiors with horrid sterile choices (me, "they painted the oak wainscoting and built-in hutch GREY!?!?!"). Those places ranged from sad to unbearable (me "what did they do with the the original cabinets, the one's they replaced with those plastic things?"). But thankfully there were several places that, oh boy, they GOT IT. Really got it. Either well preserved, or in one case, lovingly restored - a gut rehab (for damage and structural issues) that looked like it had been that way for 100 years. Simply fantastic. The event was great, and I learned a lot about what to do and what not to do. My own maxim was reinforced - don't fight your home's style, embrace it, or get a different house. Anytime someone tries to think they're clever and quirky trying to make a Victorian home in Swedish modern, or an art deco house into a Georgian, you're going to fail, and it's going to look terrible. So, keep our eyes open out there, there's a lot to learn, and lot to inspire your woodworking. Living in the Chicago area means that I have a lot of access to some great Frank Lloyd Wright stuff. As a fan of Arts & Crafts/ Prairie/ Mission/ Craftsman furniture and style, I love being able to visit the FLW Home & Studio in neighboring Oak Park, the Robie House in the Hyde Park neighborhood of Chicago, not to mention the number of houses and buildings that Wright, his partners, students and admirers built throughout the area. Like many, I have a love/hate relationship with Wright's works. They're full of intense positives: they are undeniably creative, challenging, innovative, and wonderfully thorough, while at the same time full of terrible shortcomings and flaws: often poorly built, uncomfortable, limited in utility, often with a preference for style over practical considerations. In some ways Wright comes off sort of like a high-faulutin' fashion designer, one that makes incredible designs that are totally impractical, but when their influence trickles down do the "real world", are sound and rewarding. Not always, but sometimes. 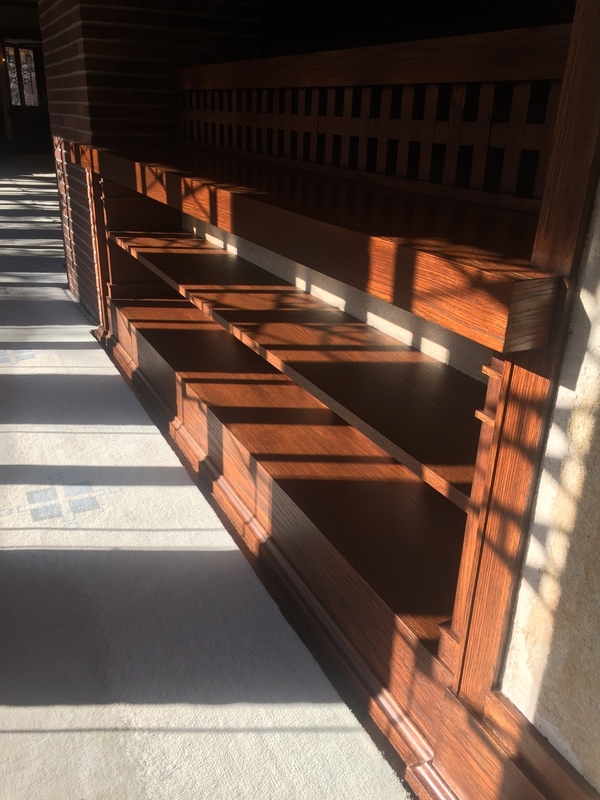 But as a woodworker, I love visiting Wright's sites and looking at the woodwork and furniture, and trying to imagine the eccentric Wright driving them all nuts as they tried to execute his ideas. 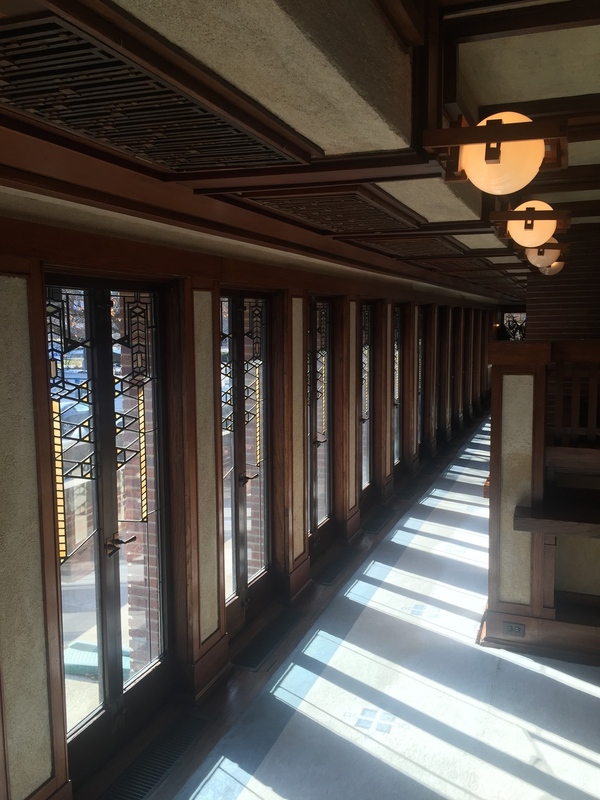 Recently, I had a chance to visit the Robie House in Chicago's Hyde Park area with my family, a place I'd always meant to go, but hadn't had the chance. Needless to say, it was absolutely great, and so very worth it on many levels. While there's a lot to discuss about the house, this post will focus on my observations as a woodworker and furniture maker. Let's get to it. Red oak. Among woodworkers, there is a pretty big crew of red oak haters out there. They have their reasons: red oak, being one of the most plentiful hardwoods in the midwest and eastern United States, is cheap, and thus, everywhere. Being everywhere, its overuse has made it tiring to the eyes. Add to that the flood of "golden oak" finished, tacky "country" style house trim and furniture, and it has been beaten. to. death. For woodworkers, they find it brittle and splintery, and some don't even like the smell! Oh poor red oak, you are indeed the red (oak) headed stepchild of the woodworking world. But, do we blame the poor noble red oak for being the victim of abuse and misuse? Is it red oak's fault that it is plentiful, and thus used on cheap pieces and tacky interiors? Clearly, that's unfair. I put it to the red oak haters that they need to challenge themselves to use red oak creatively and tastefully, and discover ways to give this maligned and disrespected wood another chance. Yeah, pretty nice. And very nice all together, the furniture and the woodwork working together. The lesson I take away from all this is that Wright took something mundane and common, red oak, and not only found fantastic ways to use it beautifully, he made it part of the whole theme, connecting the house, the interior treatments, and the furniture, to its place in the world. (I'm sure he could have just been being cheap as well, opting for red oak over white as a cost cutting measure. But look at the result). Sure, it's subtle, but the best parts of Wright's designs are just that: subtle, direct, and seemingly so simple after they're explained and pointed out that they come off as "obvious". That's the genius in great design. Thanks Frank, and red oak! its the same style/pattern that is used in the interior of my 1903 house, as well as that of a nearby neighbor's 2-flat. I am always charmed by these sorts of things that are easy to execute, yet add great presence to a piece. Hooray for someone not painting over this nice red oak! However, the mottled opaque glass in the four corners has to go. It should be clear at least. I't been a while since I've posted, but that doesn't mean I've been idle. In fact, I've been pretty productive over the winter, through the spring, and into summer. I have plenty of photos of projects, posts to make, and news to catch up on, so keep an eye out for that. Chicago has a long history with Arts & Crafts / Mission / Prairie / Craftsman styles in buildings great and small. Of course there is the quintessential Chicago bungalow, but other building styles tended to follow that general aesthetic, to greater or lesser degrees, during the 1900-1930s. Many brick "2-flat" or "3-flat" apartment buildings were built in that period, and they usually featured some art glass in the entryway, or above the mantle piece/fireplace, or in the side vestibule. I always look for these to see if someone has "gotten it" and kept them intact, or, sadly (and tragically frequently) knocked them out, or boarded them up/over.